Veterinarians solemnly swear to use their scientific knowledge and skills "for the benefit of society through the protection of animal health and welfare, the prevention and relief of animal suffering, the conservation of animal resources, the promotion of public health, and the advancement of medical knowledge." Today's veterinarians are in the unique position of being the only doctors educated to protect the health of both animals and people. They are not only educated to meet the health needs of every species of animal but they play an important role in environmental protection, food safety, and public health. In taking The Veterinarian's Oath, a doctor solemnly swears to use his or her scientific knowledge and skills "for the benefit of society, through the protection of animal health, the relief of animal suffering, the conservation of animal resources, and the advancement of medical knowledge." 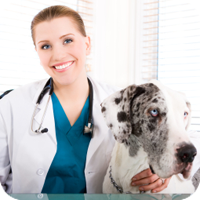 Today nearly 70,000 veterinarians are professionally active in the United States. They provide a wide variety of services in private clinical practice, teaching, research, government service, public health, military service, private industry, and other areas. Being admitted to the profession of veterinary medicine, I solemnly swear to use my scientific knowledge and skills for the benefit of society through the protection of animal health and welfare, the prevention and relief of animal suffering, the conservation of animal resources, the promotion of public health, and the advancement of medical knowledge. I will practice my profession conscientiously, with dignity, and in keeping with the principles of veterinary medical ethics. I accept as a lifelong obligation the continual improvement of my professional knowledge and competence. This section contains articles to help you better understand how veterinary medicine can help you and your pet enjoy the longest and fullest life together.